After 1500.B.C, the written book by Thomas Oberlies “Die Religion Rgveda”, wien, 1988/Gabin Flood’s “An introduction to Hinduism”, 1996, said that all those written in the Hinduism cannot even come near to the absolute truth, knowledge that lies in this prehistoric scientific religion, the KIRATI, who once flourished all over the mountain kingdom of Nepal and far to the India. Summer Solstice and Winter Solstice are the festive days of the KIRATI people that has the longest days and the shortest days in a year, and also if the solar calendar year is taken seriously, then, it will absolve all the calculations of the day, week, months, year, with any leap year.The Kirati year, Yalay, takes the Winter solstice is the beginning of the year, so Happy New Year lies in between January 19-22. It is scientifically so true in nature to describe nature, so Kirat is not only a religion, it is a prehistoric science of Kirati people.Its truth has been many times suppressed, and others have committed serious crime by trying to copyright it. The following Table displays the Calendar Year of English, Nepali and KIRATI year. 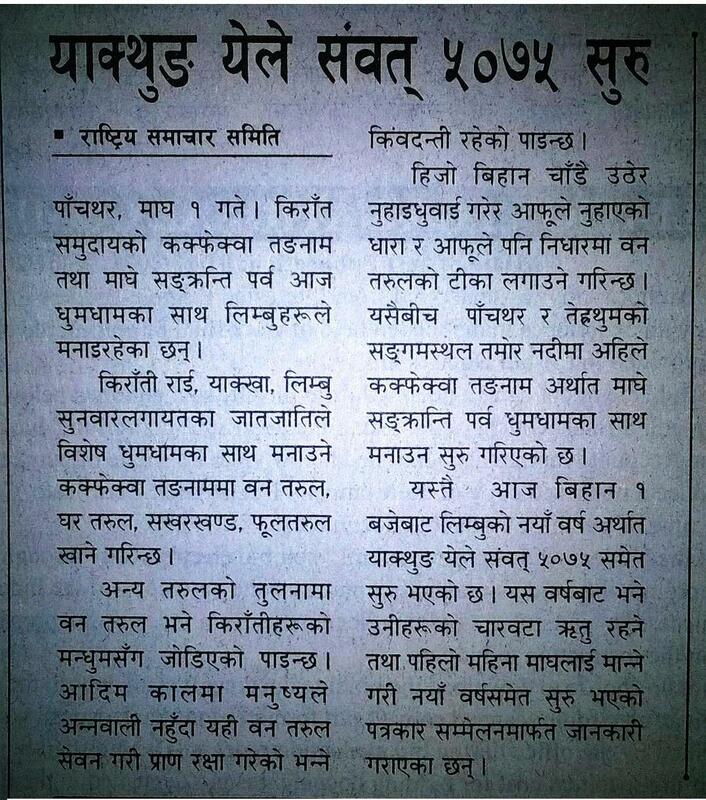 Below is recently, published New Year celebration of Kirati in Nepal’s National Daily Newspaper.